Much before Audrey Tautou became a well-known celebrity through the Da Vinci Code; her original ticket to fame was Amélie, the capricious 2001 French box office hit. Apart from winning the French Oscars, the popular César awards; Amélie was also a critical international success, getting nominated for five Academy Awards including Best Foreign Film besides winning several top awards at other global film festivals. In fact, The New York Times still considers it as one of ‘The Best 1,000 Movies Ever Made’. 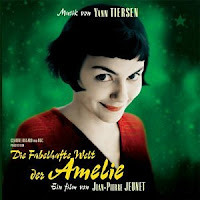 While much of Amélie’s popularity has been credited to its idiosyncratic storyline and its skilled director - Jean-Pierre Jeunet (Alien Resurrection / City of Lost Children / Delicatessen), equal credit has been attributed to the gorgeous Parisian landscape and the dazzling soundtrack by the celebrated French composer - Yann Tiersen (Goodbye Lenin). Featuring largely an accordion and piano plus novel interludes of the banjo, harpsichord, bass guitar and vibraphone, Amélie’s soundtrack is outstanding European music which you’ll relish for a long, long time. And believe me, this is no exaggeration. You can now download a MP3 version of its soundtrack that’s been converted from original FLAC files so; you can enjoy real high quality music. Files available for limited time only.